With so many divorced parents and blended families out there, differences in parenting crop up all the time. If you are divorced or separated from your child’s other parent, your experience may range from peaceful co-parenting to all-out warfare. Different houses with different rules and different parenting styles can make the experience of parenting even more challenging. If you find yourself frustrated and angry with both your child and their other parent, your own ability to act as an effective parent can seriously crumble. Here’s a common situation our Coaches hear. In the scenario described above, not only does the battle between the two parents get in the way of effective parenting, but there a few other things are at play as well: ineffective consequences and engaging in power struggles. Let’s look at these two important aspects of effective parenting. As James Lehman says, kids watch their parents for a living. Your child knows what irritates you, and I’m sure she knows how to drag you into an argument. What results is a power struggle-each one of you arguing about who is right, whether the rules are fair, and any number of other issues that are completely irrelevant. Engaging in power struggles with your child sends a clear message that not only are the rules up for debate, but the two of you are equals: she has the power to upset you. Power struggles never create the change you are looking for. Remember, just because your child invites you into an argument, it doesn’t mean you have to accept the invitation. It is up to you to resist that temptation to argue, yell, or otherwise defend your rules. Keeping your cool under stress, responding as calmly as you can, and walking away when you find yourself unable to keep calm are completely within your power-and help you claim the power in your home. Realize that your child does not have to like your rules, she simply needs to find a way to abide by them. As you stop defending your rules and expectations, and focus on helping your child abide by those rules and expectations, you’ll begin to really see a change in your own household. It is tempting for many parents, especially in the heat of frustration and anger, to remove everything from a child, down to the door on their room or books read for “fun.” Some parents might keep adding days to their child’s sentence, as our dad did in the scenario above. The trouble is, putting your child on “permanent restriction” is unlikely to change the situation; remember, as James says, you can’t punish someone into better behavior. Complete restriction is also, simply, ineffective: your child will learn to live without what has been taken, or, as you may have found, find other ways to enjoy those things without your consent. You might think that taking everything will teach your child a lesson, but kids’ minds just don’t work that way. While I’m sure that’s not the answer many parents want to hear, the good news is, you can begin to have more authority in your own home without taking everything away forever AND without giving in. Stepping out of power struggles and arguments (which undermine your authority and aren’t effective anyway) and designing clear, effective rules and consequences will help you and your child see improvement. Keep your expectations realistic, and allow your child to earn something the value each and every day. As far as rules and consequences go, don’t try to tackle every single behavior at once: it is exhausting for you, and overwhelming for your child. You might start by with basic ground rules in your house, such as no substance use, no physical or verbal abuse, and add one or two others, such as rules around curfew or homework. Once you have seen improvement in compliance with these rules, you can move on to the next most annoying or challenging behaviors on your list. To be effective, allow your child to earn her privileges day by day. If possible, match one privilege to each rule. For example: when she has completed her schoolwork by 6 pm, she has earned half an hour on the computer. If she does not complete her work, she does not get the computer time that day, but she gets to try again the next day. If she seems to have a hard time meeting that expectation, sit down with her and help her figure out what she can do differently to help her earn that computer time. Remember that an effective consequence uses something that your child values to get something you value. Don’t wait for her to “want” to do homework! Keep her “eyes on the prize,” as James says. For a thorough description of effective consequences, check out Why Don’t Consequences Work for My Teen in the EP archives. Even when parents are committed to working as a team, there are likely to be differences. When there is hurt or resentment between the parents, that teamwork is even harder. Remember that your rules and consequences apply only in your own home, and you can only enforce them inside your home. 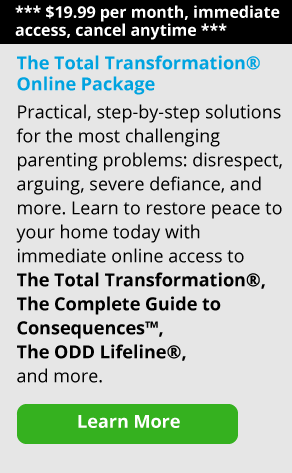 As much as you may want the situation to change, you cannot control what goes on in the other parent’s home. Trying to do so is unlikely to be effective, and pits the two parents against each other. When parents openly argue or degrade each other, your child learns how to play the two of you against each other in order to get what she wants. You may not want to, but try not to make judgments about the other parent’s rules in front of your child; doing so only serves to give your child less confidence in your authority. You have a great opportunity to role model how to appropriately and respectfully handle disagreements. Remember, no matter how the other parent behaves, you have power over your own behaviors and reactions. You may truly feel that your ways are better than the other parent’s, but just as they are not involved in the rules in your home, you are not involved in the rules in their home. When there are differences in rules, you might tell your daughter, “how your mother does things is up to her. These are the rules and expectations in our house.” Calmly and clearly claim the authority in your own home, and step out of those power struggles. No one said it was easy, but following these suggestions can help you create a more peaceful, smoothly running home: your own.